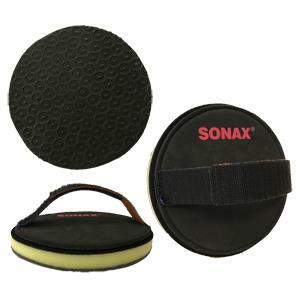 The SONAX Clay Disc cleans and smoothens out paintwork surfaces. Ideal for removing stubbornly adhesive dirt contamination, such as paint overspray, water stains, tree sap, adhesive residues and other impurities. Will treat up to 60 vehicles. Easy to clean by rinsing out the absorbed impurities with water. Can be used by hand or remove the velcro handle and attach to a backing plate of your polisher.